1.5 Million deaths each year, most being the deaths of children and are caused by the ingestion of pathogens in unsafe drinking water. These deadly pathogens include; Diarrhea, Cholera, Typhoid, and Dysentery. 860,000 children under five years of age die each year due to unsafe water. It has been calculated that 443 million school days are lost each year to water related illness. 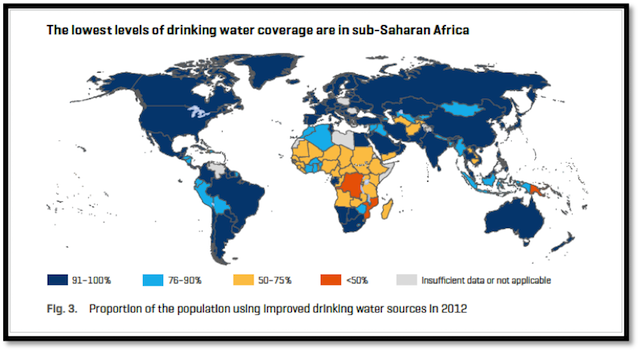 Only 61 per cent of people in Sub-saharan Africa have access to improved water supply sources, compared with 90 per cent in other continents. Sub-Saharan Africa has the largest number of water stressed countries of any region. 115 people die every hour from diseases linked to contaminated water. Four out ten people in Sub-saharan Africa remain without access to an improved drinking source of drinking water and also remain off track to meet the Millennium Development Goal 7. THIS CAN BE REDUCED BY 90 PER CENT BY THE PROVISION OF IMPROVED DRINKING PROJECTS! This is why we do it, join us in our fight to provide clean water to millions of children around the world.